Dashboard Post-it is a simple plugin for WordPress 2.7 and higher that allows you to leave yourself or other authors a note on the dashboard. It is implemented as a configurable dashboard widget, so you can collapse it, move it around, and edit it as any other dashboard widget. It will accept plain text or (sanitized) HTML. Only users with the capability “Edit dashboard” can edit the note. As of today, Dashboard Post-it is available for download at the WordPress plugin repository. Screenshots and installation instructions can be found over there. I wrote the plugin for my own use. There are alternatives, but since some of them stopped working after the changes to the Dashboard in WP 2.7 and others are not widgetized, and since this is a much requested feature, I decided to submit the plugin to the repository. 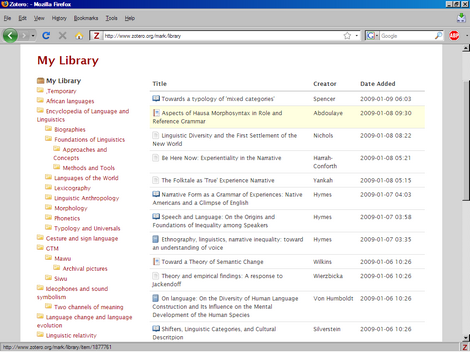 Phonology Assistant (PA) is a free phonology tool by SIL that (as of version 3.0) works interactively with the data stored in Toolbox, Fieldworks Language Explorer, and Speech Analyzer. It automates many of the cumbersome and repetitive tasks associated with doing phonological analysis, and it does so in a most systematic and revealing way. The things it does more or less automatically include drawing up a phone inventory; computing relative frequencies of phones; computing syllable structures; generating phonotactic charts for every conceivable combination of positions, phones, or features; and finding minimal pairs along various dimensions. 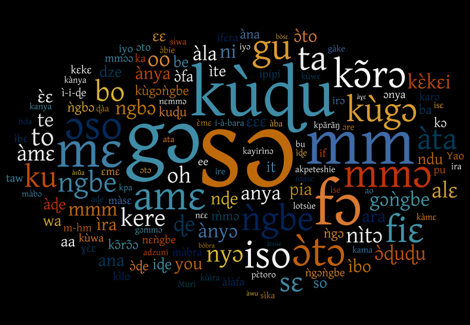 A powerful search function allows the user to search for phonetic patterns within specified environments. A review of Phonology Assistant by me was published yesterday in Language Documentation & Conservation. It’s a tremendously useful tool — anyone who has ever been faced with the task of doing phonological analysis will know that it can grow enormously complex, especially if one wants to be comprehensive and look not just at simple positional distribution (initial, medial, final) but also at occurrence in different environments (intervocalic, before voiced fricatives, after a nasal consonant, etc.). PA assists in these household chores, and does it all with an interface so smooth you wouldn’t notice the conceptual complexity of the tasks. Check out the review (pdf) or the PA website. Dingemanse, Mark. 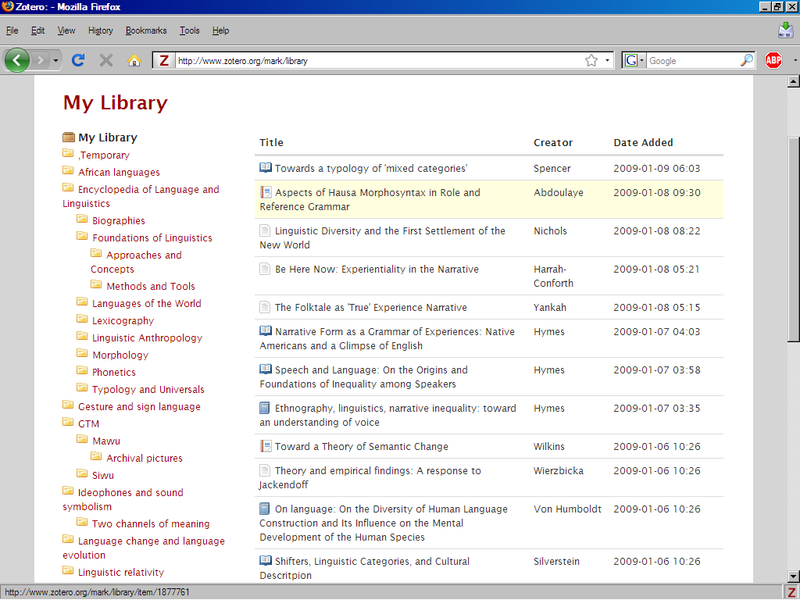 2008. Review of Phonology Assistant 3.0.1. Language Documentation & Conservation 2, no. 2: 325-331. doi:http://hdl.handle.net/10125/4350. The Ideophone has found a new home at http://ideophone.org/. Links to the old pages should still work, but I would like to ask readers and fellow bloggers to update their bookmarks and blogrolls. The move was planned to take place in September but it had to be carried out prematurely because my provider itself was migrating their servers and I didn’t want to go with them. Being in the field for five more weeks I had no quick way of fixing it. The ever so helpful Lieuwe of ON2IT Security came to the rescue and carried out a swift and smooth migration. Lieuwe, you owe me! Readers, thanks for understanding, and welcome back!